The one hour stage show 'ODANI' and The 30 minute show 'JOHSAI' are performed by our kembu masters. You can also satisfy your intellectual curiosity with in-depth talks. In Japan, there are a lot of traditional arts. 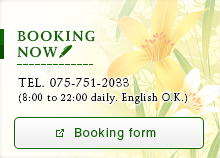 The tea ceremony, the flower arrangement, the Noh play, and etc. When these arts occur or how they approach a subject are different, but all therse traditional arts show the Japanese people's sence and way of thinking. Kembu, one of these traditional arts, show the culture of the warrior class, the samurai. 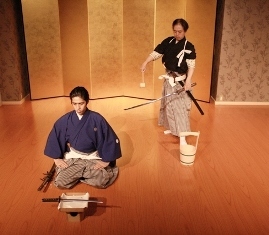 Traditional kembu uses Japanese short poems, whch were mostly written by Samurai before major events in their life.In feudal times, samurai were said to perform Kembu to give themselves courage or to achieve mental concentration. Wearing samurai cloths, holding a sword and fan, the samurai spirit is expressed through this traditional performing art. When Samurai are 6 years old they are given a sword. They learn the responsibility of carrying a dangerous weapon and also gain a sense of pride. We will show you some practices of the samurai. You can enjoy the free style kembu performance based on a historical story. After the performance you can take pictures with the masters. Evening show 'ODANI' (60min.) Long-run stage since 2014.